the first picture book for Peter Abrahams, the New York Times bestselling author of 25 books, including the Echo Falls series for middle graders. Peter's YA thriller, Reality Check, won the 2010 Edgar Award for best young adult novel. His most recent YA thriller was Bullet Point (Harper Teen, April, 2010). His upcoming YA novel, Robbie Forester and the Outlaws of Sherwood Street, (Philomel Books) -- middle-grade suspense with a bit of paranormal -- will be released January, 2012. He is also author, as Spencer Quinn, of the Chet & Bernie Mystery Series. Frank Morrison has illustrated 16 books, including Queen of the Scene by Queen Latifah and Jazzy Miz Mozetta by Brenda C. Roberts, for which he won the Coretta Scott King/John Steptoe Award for New Talent. To start off the tour, I'm delighted to feature an interview with Kristin Daly Rens, who edited Quacky Baseball. Kristin became interested in children’s books as a career during high school, when she worked in her local public library shelving—and often covertly reading!—books in the children’s room. After completing her Master's in Comparative Literature at UNC-Chapel Hill, she became an editorial assistant at Golden Books in 1999. 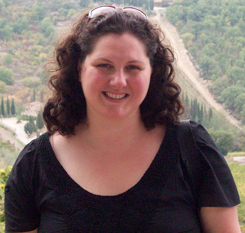 Kristin joined Harper Collins in 2002, and has been with the publisher's Balzer + Bray imprint since 2008. She has worked with authors and illustrators such as Michael Bond, Lee Bennett Hopkins, Jack Prelutsky, and Barbara McClintock. She is especially excited to be working with several talented newcomers to the Harper list, including Sudipta Bardhan, on the picture books Pirate Princess and Hampire! ; Audrey Vernick, on the picture book biography She Loved Baseball: The Effa Manley Story and the humorous picture books Is Your Buffalo Ready for Kindergarten? and Teach Your Buffalo to Play Drums; Diana Peterfreund, on the YA unicorn hunter fantasies Rampant and Ascendant; and debut authors Jeff Sampson, on the YA novel Vesper, and Crystal Allen, on the middle-grade novel How Lamar’s Bad Prank Won a Bubba-Sized Trophy. Quacky Baseball is a fun and funny picture book that would appeal to all kids, many of whom will probably identify with Thumby. The book will likely have a special following among boys. To what extent, if any, is that a consideration when choosing picture books to acquire/edit? KDR: Our first concern in acquiring a book in any genre-whether it's a picture book, middle-grade, or YA-is of course that it's a great story, written well. Ideally, I always hope that the books I acquire and edit will reach both boy AND girl readers-though of course some books do appeal more to girls than to boys, and vice versa. All of that said, I've always been a bit of a tomboy-which comes in large part from having grown up with two brothers, I suspect!-and am a big sports fan, so I do tend to gravitate toward books that are great boy reads, like this one. The book is a great marriage of text and illustrations. I gather you inherited QB when it was already in progress -- but can you give us a brief play by play from the editor's POV on how that vision came together? KDR: I did indeed inherit QUACKY BASEBALL when it was already in progress, after its wonderful first editor left Harper. Which was a very happy coincidence for me, as I'm a sucker not only for a good baseball story but also for adorable ducklings-and QUACKY is the perfect marriage of both! Any picture book editor will tell you that one of the most fun parts of editing books in this genre is getting to research illustrators. Sometimes we read a manuscript and the text will seem absolutely perfect for one particular illustrator. Other times the choice won't be so immediately clear and we'll research artists, looking at online samples, scouring our own bookshelves, and spending some quality time in the picture book section of our local bookstore. In this particular case, not only had Peter's original editor worked with Frank Morrison on a previous picture book called QUEEN OF THE SCENE, but Frank had also illustrated Alex Rodriguez's picture book OUT OF THE BALLPARK-which of course featured lots of baseball scenes-for another Harper imprint. And so Franks' bold, vibrant art style-which captures the winning spirit of QUACKY BASEBALL so well-along with the fact that he was familiar with baseball really made him the natural-and perfect-choice. Even though I came onboard after the fact, I really can't imagine a better match of text and art-Peter's words and Frank's illustrations really do complement each other wonderfully well. Are you a baseball fan? To what degree did your knowledge of baseball play a role in editing this book? KDR: I love baseball! With parents who were born and raised in the Bronx, it was pretty much mandatory that my brothers and I become Yankees fans. In fact, before I moved to Brooklyn, my brother Kevin and I actually had Yankees season tickets together for several years-I was a Bleacher Creature! While I love baseball books, I only get to actually work on one every once in a while, but this past year I actually found myself editing two-QUACKY BASEBALL and an equally wonderful nonfiction picture book called SHE LOVED BASEBALL: THE EFFA MANLEY STORY by Audrey Vernick, the story of the first woman inducted into the National Baseball Hall of Fame. Needless to say, both books had lots of fantastic baseball illustrations. Well, with any sports story, you want to make sure that the details of the illustrations are accurate-everything from the styles of the gloves for the various player positions, to making sure the right number of players are on the field, to making sure the players had the correct grips on the bat. Our managing editor and I spent lots of time poring over art and recreating batting stances in the Harper offices to be certain the details were just right-and got more than a few funny looks from passersby in the process, I'm sure. Everyone who reads, writes and illustrates picture books was shaken by the October New York Times article that pronounced doom for the picture book, and heartened by the recent Publishers Weekly article quoting Leonard Marcus, on how the picture book is still relevant. Can you share your outlook on the picture book market? KDR: I think everyone in children's publishing, both on the writing side and on the editing side, was taken aback by the Times article. The so-called death of the picture book has been discussed at length over the past months, and I'm not sure I have too much more to add above and beyond what's already been said. But I can say this: I've been hearing folks heralding the death of picture books since my editorial assistant days. It's almost twelve years later, and not only are picture books as a genre still around, but some picture books even manage to sell amazingly well. I firmly believe that as long as there are young children learning to read, and parents, grandparents, and teachers to read to them, there will be a need-and an audience-for picture books. What keeps you engaged in your role as a children's book editor? What enthralls you about your work? KDR: What keeps me engaged is, quite simply, the fact that I love my job. I've always been an avid reader of children's books, but my interest in publishing as a profession began in high school, when I got a job as a page in my local public library. None of the other pages wanted to shelve books in the children's room-skinnier books meant more books per cart, and thus more work-but I found myself drawn there. I loved to skim the picture books as I shelved...and I freely admit to having spent a lot of time hidden in the stacks reading the books when I should have been working! And I think a part of me knew even then that I would "grow up" to work in children's publishing. This is a pretty typical story for folks in children's books, I've found. From the authors and illustrators, to the other editors at Harper, to the designers, to the sales reps, everyone in this business is in it because they love children's books and care deeply about creating great books for young readers. Children's publishing is a business driven by passion. As for the actual job of being a children's book editor, there are so many things that engage and enthrall me every day-from drafting flap and sales copy for projects that you adore (and want other readers to discover and adore as well), to brainstorming with authors, to collaborating with designers on cover visions, to offering ideas and suggestions to an author that may open up possibilities and enable them to see their manuscript in a new and exciting way. And of course there's the fact that on any given day I could fall in love with a new manuscript or a new writer and get the chance to work with them. On the flipside, whenever you fall in love there's always the chance your heart will get broken, and there have definitely been manuscripts that I've fallen in love with but lost at auction that have hurt me as much, if not more, than any breakup! But on the whole, I feel grateful-not to mention lucky-every day to be doing something that I love. Quacky Baseball's launch is in perfect timing for the opening of baseball season. Are there plans for any promotional tie-ins linked to the game? KDR: The decision to publish QUACKY BASEBALL just before the start of baseball season was definitely a strategic one! Baseball fans are passionate fans who eagerly count down to the start of the season every year, so we wanted to get QUACKY out into the world right at the time fans are most excited for the start of the season so that the book will jump out and grab those young fans-and those parents who are fans-who can't wait for their favorite sport to start up again. Thank you so much for the wonderful, insightful interview, Kristin. Comment here -- or on any blog along the tour -- and you could win a signed copy of the book! P.S. As many of you know, Peter is my brother. First of all, I love baseball, so I need to get the book for that reason alone. Add to that, being the Father of two 5-year olds, it is a great opportunity to pass along my baseball love to them. Lastly, as a school counselor, it will be a nice addition to my library. I enjoyed reading the interview, too. Thanks a bunch. Ducks and baseball - what could be a more natural pairing. I often wondered exactly what an editor did. Now I know. What a fun job. Thanks for the interview. Megan, you know I have been waiting a long time for this blog tour to come. This will be a very interesting week hearing from all the people who created this wonderful picture book. Thank you so much for doing this. I bet your brother really appreciates it too! I can’t wait to read the interviews with Thumby and Peter Abrahams. Many thanks to Kristin Daly Rens for her insightful answers! She has the best job ever! Great cover illustration. I definitely belong to Camp Quacky. Brother huh? Hmmm...talent runs in the family. Is there anything Mr. Abrahams can't write? 25 books! Holy inadequacy Batman, I'm hanging up my keyboard. Out in Left Field, have you read anything Peter Abrahams has written? He is a most excellent writer that’s for sure. He writes anything from middle school, young adult to very adult thrilling fiction. And now a Picture Book! What’s left? I hope someone asks him that when they are interviewing him. Wonderful work Peter! I am looking forward to learning about baseball. This is just my speed! Yay for Quacky Baseball! Excellent interview, ladies. Great interview. I've heard wonderful things about Kristin and hope to meet her at a conference one of these days. And as you already know, I have a five-year-old son who loves Peter's book! So' well be reading Quacky Baseball a lot at our house. Megan, another great interview. This book is such fun! and I loved reading Kristin's editorial viewpoint. Always fascinating and enlightening hearing from an editor. Thanks for commenting, Counselor and Dawson. It was such a pleasure to interview Kristin. 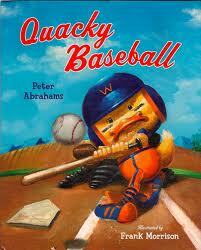 As for Quacky Baseball -- what a fun book! Lee Rae, thanks so much for commenting. Great to hear from you again. I agree, Kristin's answers were so thoughtful and interesting. I hope you enjoy the tour. I certainly am! And that is a good question for Peter. And on that topic -- Susan, thanks for commenting and congratulations to you too! I understand you have a book deal with Beach Lane. Fantastic news! Pen & Ink, Julie, Corey and Diane, thanks very much for commenting and participating on the tour. I'm glad your son is enjoying Quacky Baseball, Corey, and I hope to meet Kristin at an upcoming conference too. Great article, Megan. So this proves there's a lot of brilliance in the Abrahams family. I can't see why picture books would die. I'm so glad that they're still here, and that you, Kristin, think they'll endure. I've read to my children. I read them to my children and loved them as much as they did. And now my grandchildren do. They've GOT to survive. Thanks for all your work on this blog tour, Megan. It's been lots of fun - at least for me. All the interviewers were great. Meanwhile the Red Sox are off to a shaky start. What's up with that? My pleasure, Peter. I'm really happy we did the tour. It's been lots of fun for me too. As for the Red Sox -- I felt much better when I realized they still have 159 games to go. Can't wait to check out Quacky Baseball for my 7-year old son. I thought the interview was great!